SetSail FPB » Blog Archive » Old Aluminum Yachts – How Do You know The Hull Is Sound? The 30 year old Deerfoot II recently had the thickness of her hull plating surveyed, and we thought the results might be of interest. The process measures thickness on a grid, which you then compare to other nearby measurements looking for variation. As you can tell from the attached report, she has aged gracefully. In fact, it would be interesting to compare this three decade old alloy hull to the average production sailboat of the same years built in fiberglass. Bottom line (pun intended): if you are concerned with a metal hull, integrity is easily checked with non destructive testing. Thanks to Erik Dolson, who allowed us to reprint the report. This entry was posted on Tuesday, July 21st, 2015 at 6:09 am and is filed under Cruiser's Tech Talk. Both comments and pings are currently closed. 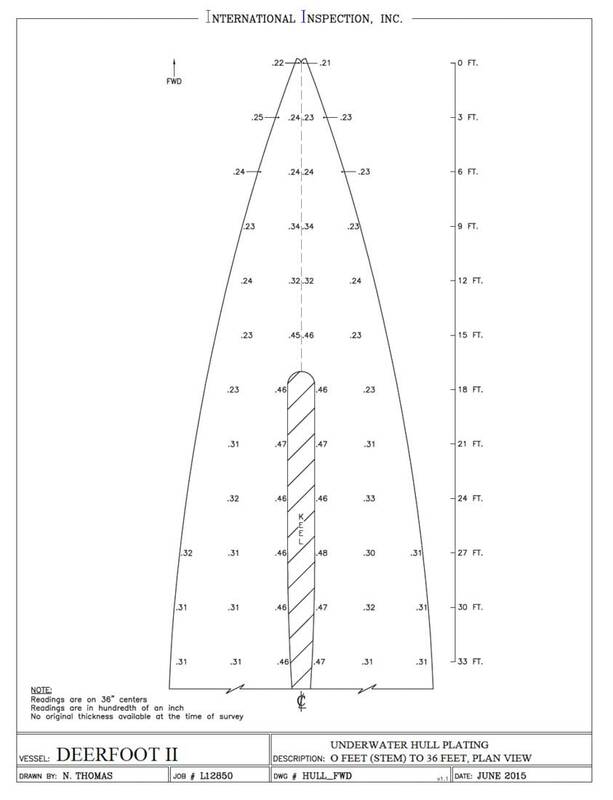 Interesting – what was the original hull thickness, can you remember? I have a 1975 built Ocean 71 (71 foot 48 ton grp ketch), so your comment about fibreglass interests me. I dont think the thickness of the GRP would have changed, but what do you think about its strength? Original thicknesses are indicated by the thicknesses of the metal, since these are consistent and congruent on either side of center. Re GRP, depends on the resin used, and whether or not there has been moisture intrusion. Perhaps I am missing something. The report expressly states “no original thickness available at time of survey”; and I don’t understand Steve’s response to Nigel’s question. The consistency of the readings, port to starboard and tapering towards the ends tells you the material is still there. She was built with six, eight, and 12mm plate, and the readings indicate these dimensions.